It was not that i was always running. It was always team sports till i left college -footer and Basket ball. For a few years after college when gyms and fitness places werent the fad as is now, i was quite alarmed at the rate at which my body weight was heading North. So it was out of sheer necessity i took my baby steps in running. Madras as it was called then ( circa 1990) was less populated with fewer vehicles on the road. Of course the roads were poorly lit . On a cool December morning i ran towards the beach as i lived in 600028. There was no stopping after that. Not that i ran long distance but never skipped my run. I did not know then K terminologies then but it must have been def less than 10k . Once i turned 40 my Doctor pronounced “Thou shall run no further” . The fitness rage was still decades away in this part of the world and many of my friends found solace in their Docs words. I somehow missed the morning breeze hitting my face , the walkman singing in my ears and the sweat dripping down. The days were so incomplete that i told my wife that i plan to listen only to my body . So i started running again. For the last twenty years thanks to God’s Grace i have been running and was witnessing the rapid changes around me. I saw more cars on the road, more and more gyms springing up, beach getting more crowded with joggers and runners and slowly started hearing the buzz words – 10k, HM,FM . By then my status in life has moved from young man, to uncle . Children grew up and elevated me from being a father to a Grandfather. It was only about 18 months back i decided i have to prove the famous adage – age is just a number . What better way than to participate in a long distance run? Much against the advice of my wife,children and my grand daughter, once again i decided i will listen only to my body. So i picked the evergreen 21. 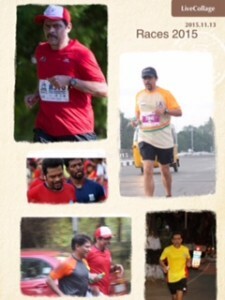 It was Wipro 2014 i ran my first race – half marathon – few months before i turned 60. It was my good friend Sahul who i was fortunate to work with years back who encouraged me . Adrenalin rush on reaching the finish cannot be explained but only experienced . Since then i have myself volunteered to train few of my friends to run . I plan to till run my body gives me the signal to stop. 21@ 60 sounds nice. Its not just a reference to the distance run when i am sixty it is how young I feel when i run these distances. So all of you who think you are too old to run , start tomorrow. It is never too late. You will realise what you were missing so far.